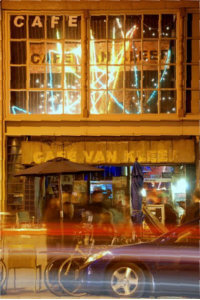 Cafe Van Kleef has an ever changing calendar and the cover charge may very depending on the night. They usually have a cover on Thursday, Fridays and Saturdays. They have no Happy Hour or drink specials but they are famous for their Greyhounds. I like this place for it’s environment and vibe. I usually stop here for a drink on the way to The Uptown(now closed). It’s a very chill place on a slow night with awesome stuff all over to check out or a very poppin place when it’s packed with a live jazz or blues band. I would recommend it more on a slow night as the place is very small and gets too crowded fast. You can expect to wait a while for a drink on a busy night. Like pretty much most bars in Oakland they do not serve food but there is often a hot dog vendor somewhere on this stretch of Telegraph. If you want an over priced snack. Hours very random, check site. 1621 Telegraph Ave, Oakland, CA. I used to love this place but the transgender bartenders have been treating men more and more disrespectful and discriminating lately. If a woman walks in, she is instantly helped but some of these bartenders have such a hatred for men you can almost see them foaming at the mouth. It all began when a few of us came in one night. We’re all decent looking guys who work out often and the instant we came in, we hear the bartender say, “look at these d-bags” under their breath. We literally had done nothing but walk in so we turned around and left; completely offended. This last time was the last straw where they had me and my friend waiting for 25 minutes simply because we were men. We could hear them talking about “men being so entitled” and laughing at us waiting. When they finally came around they condescendingly asked me what I wanted; I got my drink and then 30 minutes later, I was patiently waiting and politely smiling at the bartender. A young girl walks right past me to the bar and the “zee” bartender instantly asks her what she wants. Absolutely ridiculous. In Oakland, one of the most open and accepting cities; it’s a shame that reverse sexual discrimination is now happening. The most ironic part is yes I’m a man; but I do not cat call, I do not condone the belittlement of women in our already overly patriarchal society, and I am one of the most understanding people when it comes to trans gender. Me and tons of my friends from the area have been coming here for years without problem; but never again. Male or Female alike, we’re over it.